Freddy Roman at work banding a drawer front. 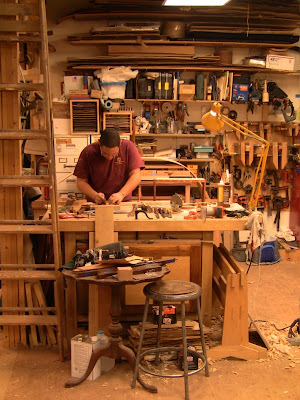 I met Freddy Roman, maker and restorer, through the Society of American Furniture Makers. He's the coordinator for the New England chapter, where he organizes meetings and demos throughout the year. I was impressed to see such a young fellow taking an active leadership role in the society. After talking to him, I was further impressed by his dedication to the craft and sharing it with others. He wants to hand it down to the next generation. He's here to educate, not keep secrets. 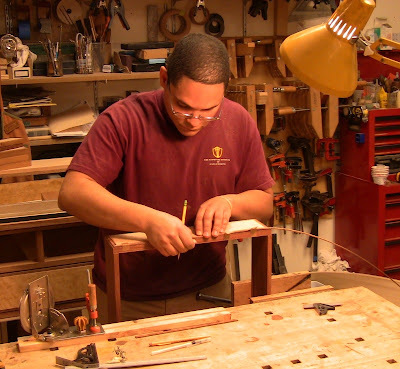 Freddy is a 2006 graduate of the 2-year program at Phil Lowe's Furniture Institute of Massachusetts. I have the highest regard for Phil and his school; before going out on his own, Phil ran the furniture program at the North Bennet St. School in Boston. Freddy is a prime example of his students, highly skilled, producing beautiful work. 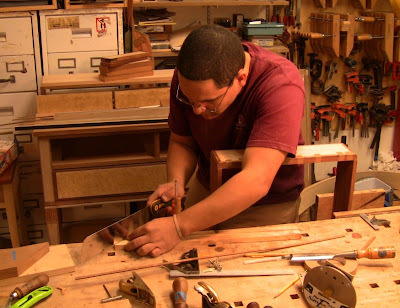 Freddy currently has a shop in Littleton, MA with Will Neptune, another former North Bennet St. instructor, where he specializes in custom Federal furniture-making and antique restoration, with a particular focus on veneering and inlaying. 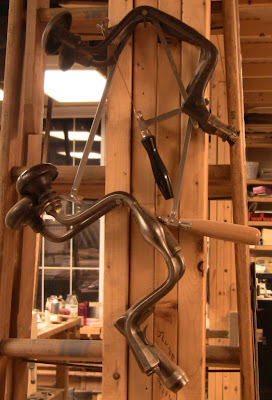 He makes intricate custom banding that he sells and uses in his own work, and also builds and repairs harps. These are very detailed, specialized skills. In addition to private restoration work, he also does museum work. He worked with Phil Lowe on the Samuel McIntire exhibit at the Peabody Essex Museum. He worked on a period room for the Yale Museum while working for Fallon and Wilkinson, and also worked on pieces for the Hamilton Grange Estate Museum. Freddy is a graduate of the Furniture Institute of Massachusetts. Freddy's interest in woodworking started when he was 8 and his uncle gave him a Stanley tool chest full of hand tools. Initially, he went to college to study architecture, because he loved to draw by hand and build scale models. However, he got tired of giant classes where he got lost in the crowd, with no opportunity to interact directly with the professors. He started taking woodworking classes at the nearby Connecticut Valley School of Woodworking. His first class was with Garrett Hack, where he developed an interest in inlay. He got his true passion for Federal work from Steve Latta, who he says is a great teacher. It was at CVSW that he met Phil Lowe, who saw his work and told him about the FIM program. During the off-time between the two 10-month intensive periods at FIM he worked as the school's shop manager. In the summer of 2008, Will Neptune called Freddy and suggested they open a shop together. He jumped at the chance. Their current location is in guitar-maker Julius Borge's former studio in an old mill building in Littleton, MA. Ironically, I had worked just across the street at the former Digital Equipment Corporation 12 years earlier. Freddy says Phil Lowe gave him a real education in hand tool work, and Will Neptune gave him a real education in power tool work. He works about 50/50 power and hand tools. That strikes a balance of cost efficiency in time saved using power tools, while achieving the authentic look of hand tools. He does primarily commission work, with some pieces built on spec for exhibitions. 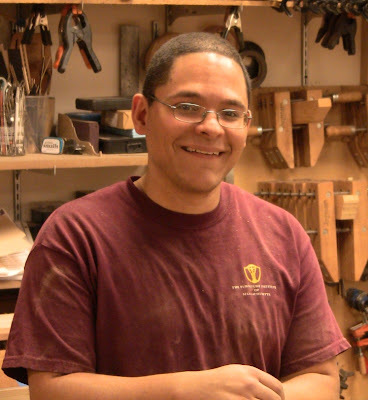 He teaches classes at CVSW, and has just been accepted into the New Hampshire Furniture Masters Association. Here are two pieces Freddy has been building on spec. My photos don't come near to capturing the real beauty of this work. It's best appreciated in person, where the wood grains flash in the light as you move around the piece. The first is a Federal dresser with a variety of spectacular veneers and inlays, for the SAPFM exhibition at the Connecticut Historical Society. The exhibition runs from March 30 to September 8, where you can see a variety of current work from SAPFM members. More information is available here. The second is a serpentine card table built from "scraps". 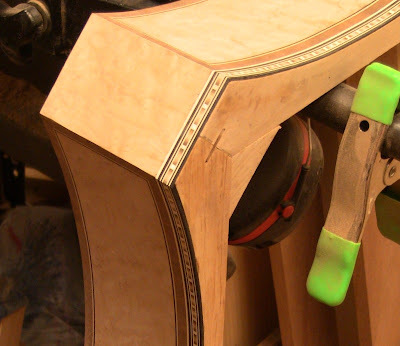 In a shop like this that means more gorgeous bits of veneer and inlay. The substrates are white pine and basswood. These lightweight secondary woods are period-authentic. A Federal period dresser Freddy is working on for exhibition. It has a variety of veneers and inlays. Closeup of some of the fine details. Beautifully-grained veneers that glow even without finish, black-and-white stringing and complex banding. The drawer front is awaiting edge banding. This is what the finished dresser will look like. Freddy uses this photo on his website and marketing materials. It's also featured on the CHS SAPFM exhibition materials. Front and sides of the serpentine card table. The front secondary wood is basswood, while the sides are white pine, meeting in a splined corner. These are overlaid with a variety of veneers and bandings. This was sawn out with a bowsaw and hand-scraped. 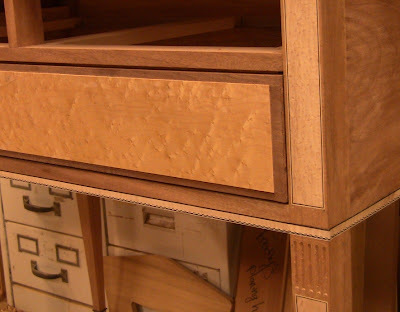 Closeup of the corner joint and veneers. 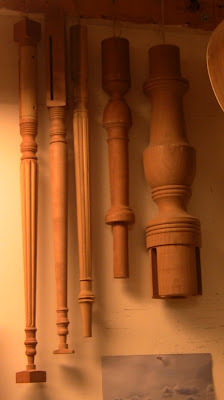 Some of his turned and carved leg samples. He'll be using a variation of one of the delicate legs for the card table. 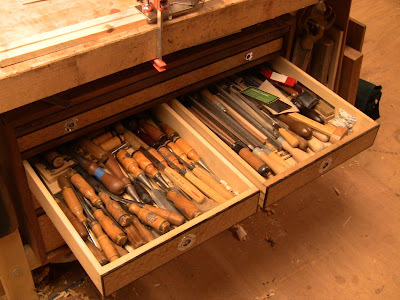 Freddy keeps most of his hand tools in a beautiful toolbox sitting under his workbench. This was one of his major student projects at FIM, the first veneering he ever did. This is the style students build at the North Bennett St. School, though a bit larger. He estimates it weighs about 500 lbs. full. 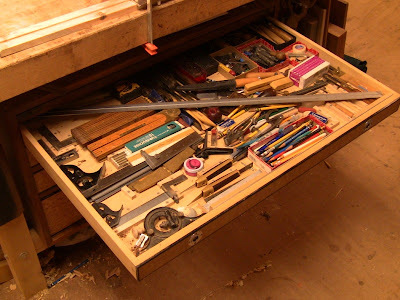 The box keeps all his tools organized and close at hand. 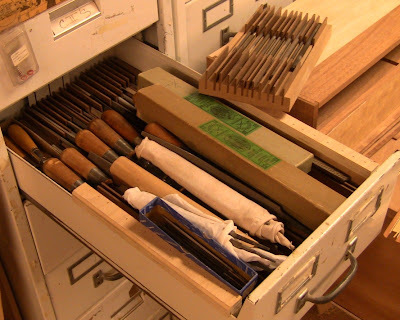 While the drawers aren't French-fitted, the tools are fitted into place with dividers, so he can instantly tell when something is not in its place, and what it is. Freddy's toolbox. A pull-out door drops down to secure the front with old brass machinist's alignment pins. 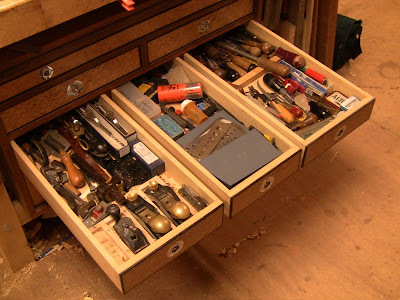 The top drawer for measuring and marking. He sized the overall dimensions so that he could fit his 3' Starrett rule diagonally. 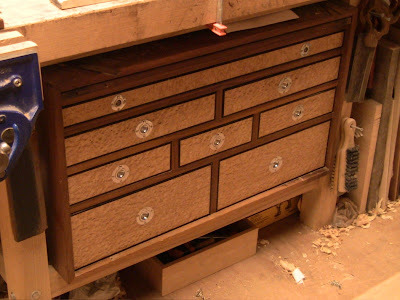 The chisel and rasp drawers. Small planes, drill bits, and screwdrivers. Bench planes. 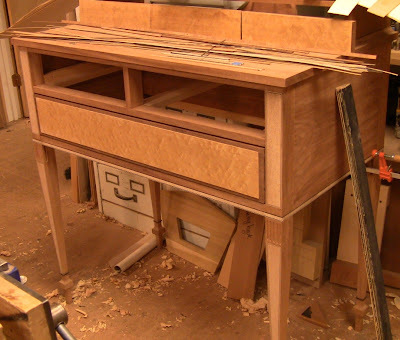 The length of the jointer was the other determining factor in drawer size. 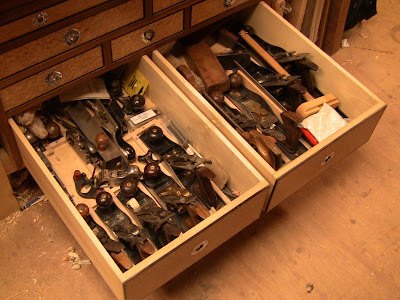 He keeps a variety of specialized tools and supplies in several other chests and cabinets, again organized by function. Inlaying in particular results in lots of small things to keep track of, pieces of veneer, partial and fully-made banding. 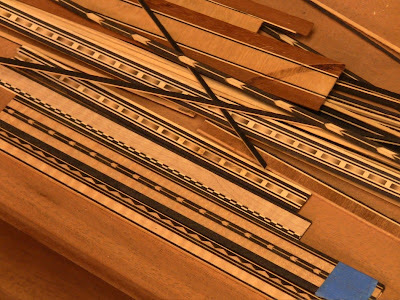 A block of veneers laid up in a pattern is known as a "log"; Freddy slices thin pieces off to form a banding, which may be ready to use or may be further glued up into a log for a more complex pattern. 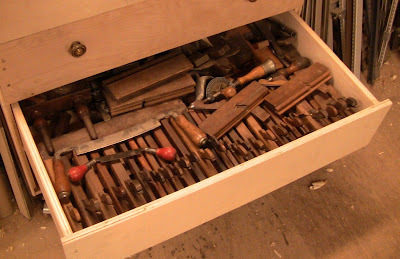 In another chest, a draw full of molding planes. 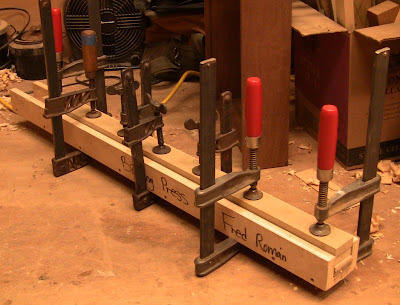 A great eBay find, a collection of rasps and files from a retiring woodworker. 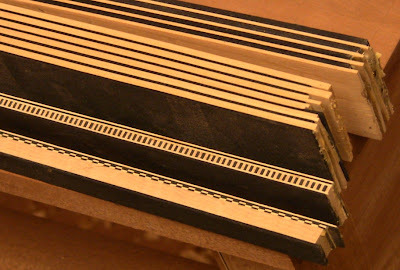 Freddy uses these blocks to illustrate the steps in veneering and banding. 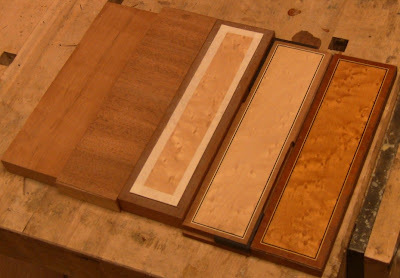 From left, the substrate surfaced with a toothing plane; a layer of cross-veneer applied for stability; the main veneer applied and trimmed, the edges protected with tape; a piece with banding and partial cockbead applied; and a piece with finish applied. 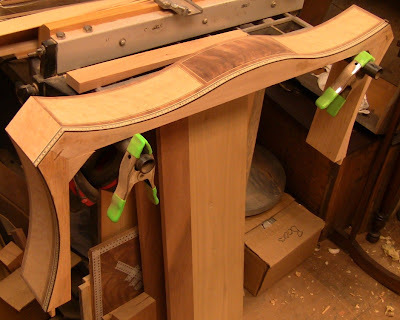 A brace of braces and fretsaws, including the Spofford brace I gave Freddy last year. 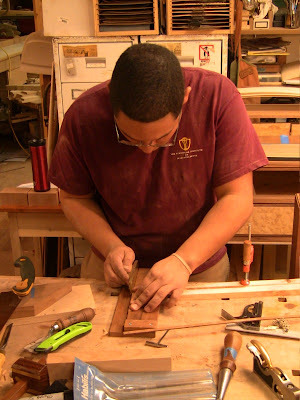 In addition to technical skills, Freddy learned how to run a custom woodworking business at FIM. I think it's instructive to review the standard accepted business practices that Phil Lowe taught him. These are meant to protect the interests of both clients and maker. Freddy lays these all out when first meeting with potential clients to work on a commission. 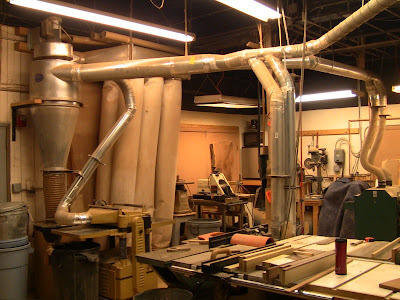 Most of his business comes from referrals, recommendations, and word of mouth, from clients and other woodworkers. This business involves a lot of detailed creative work, materials, and time. It's not like ordering a set of kitchen cabinets from a home center and having them installed once they've been fabricated. It's a significant investment for both sides, often reaching into the thousands or tens of thousands of dollars, with many hours of skilled work. The clients need to know they are working with a trustworthy craftsman, and Freddy needs to know he will still be able to earn a living if the project gets canceled. It's a relationship built on mutual trust and shared risk. The first meeting is free. This is where the clients outline their ideas, what they're looking for, what kind of woods and styles they're interested in. The project might involve furniture, architectural elements, fine cabinetry, etc. The second meeting requires a fee to cover gas and several hours of time. This starts to involve detailed measurements and sketches, to match existing furniture and woodwork and determine the space. The third meeting on is billed as time and materials. At this point Freddy is starting to invest a significant amount of time in design work. The creative process has started. 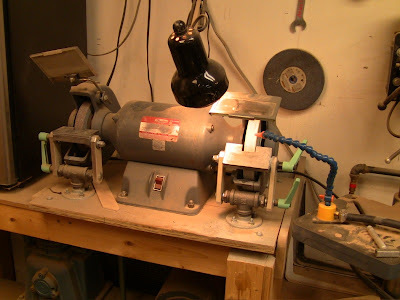 His shop rate ranges from $45 to $75 per hour, depending on the project. Freddy provide a sketch for free. He then provides an estimate at an hourly rate to draw scale and full-size drawings. It's always worth the additional expense of full-size drawings because they avoid mistakes and delays, and make for more accurate estimates. They show physical stature for matching up with existing pieces. He compiles rough and finished cut-lists and makes detailed notes of work procedures required. The drawings are Freddy's intellectual property, to which he owns the rights. He will sell the rights for an agreed-upon fee. Samples require a fee for materials, with a deposit. As with drawings, these are Freddy's property for which he owns the rights, but he will sell the rights for a fee. The deposit puts the clients on Freddy's list if he's backlogged. He keeps either the drawings or the samples in his possession at all times to protect his interests. Once the clients sign a contract and make initial payment, Freddy gives them a copy of the drawings (not the originals). They sign and date the samples, Freddy cuts the samples in half, and each party keeps a half. This shows client approval. Payment is 50% on contract signing, which covers time in up to that point and buys materials, followed by 25% when half the work is done, and 25% when the work is complete. Freddy delivers once payment has cleared, up to 50 miles. If the clients decide to cancel the project, Freddy keeps a 20% cancellation fee, which he holds for a year in case they decide to resume it. Freddy provides progress photos every couple of weeks, and clients are free to make appointments to visit the shop. He guarantees all his work, understanding that wood moves. The result at the end of the project will be beautiful heirloom-quality work that will last for generations, reflecting the professionalism of a dedicated, highly-skilled craftsman. Here is Freddy at work applying edge banding to one of the drawer fronts for the dresser. The central veneer and stringing are already in place. He carefully fits each individual piece to avoid gaps. Laying out a piece of edge banding on a drawer front. He uses luthier's tape to hold it in place temporarily, a trick taught to him by Julius Borges. Sawing a miter in a small miter block made to hold the banding. Using a boatbuilder's slick to pare the miter. Shooting the edge of the banding so it fits seamlessly against the main veneer. Another drawer front already veneered. 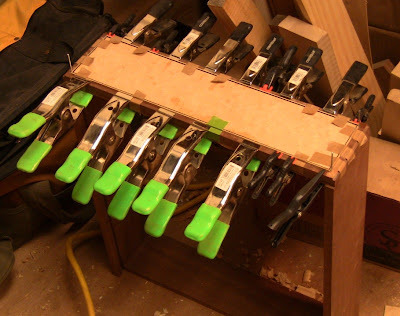 Lots of clamps and luthier's tape to apply even pressure. 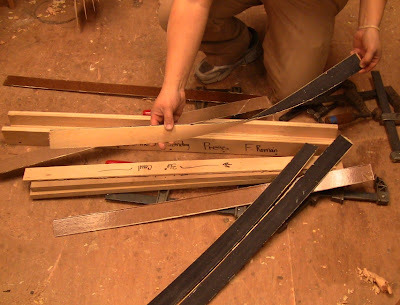 In addition to furniture, Freddy builds and repairs harps. This is another very specialized craft. There just aren't that many people who do this kind of work. 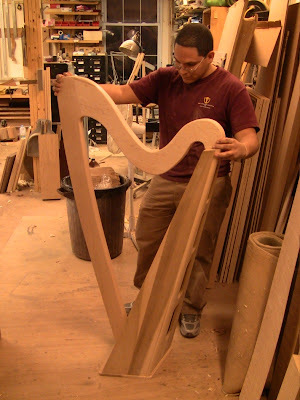 A harp in progress. Like a guitar, it has a spruce soundboard. These are student-grade harps, but Freddy also works on concert harps. Veneers and bandings are Freddy's specialties. The bandings are amazing, glued up in multi-step sequences to form complex patterns. 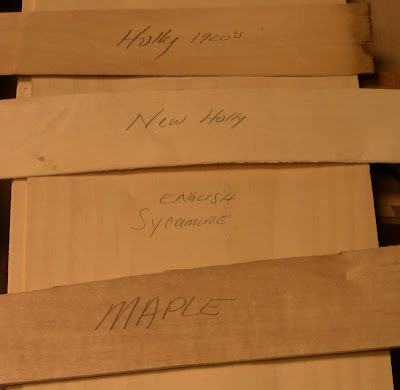 A comparison of various white woods for stringing. At top is a piece of holly cut in the 1920's; this is precious stuff. The color has darkened a bit over the decades. A piece of new holly below that, with maple at the bottom. They're all resting on a long strip of English sycamore, which makes a good lower-cost alternative to holly. A thick bird's eye maple veneer from New Hampshire, with a piece of solid tiger maple. 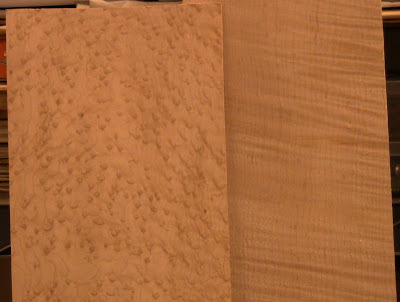 The tiger maple is rough-milled, but even with the unfinished surface the grain flashes in the light. Some of Freddy's many custom-made bandings. Several "logs" of stock glued up for bandings. The upper two striped logs will be cut down and pieced together with other veneers for more complex forms, such as the lower two. The veneer press for gluing up logs. The contents of the veneer press: separate pieces of black-and-white veneers to be made into stringing. 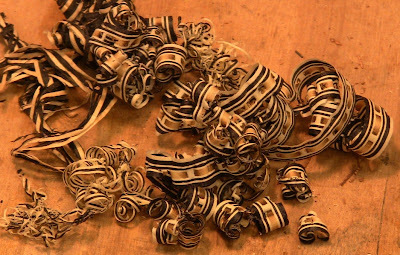 The plane shavings of a banding-maker. I love these complex patterns. The remaining photos show Freddy and Will's shared machine room. One of Will Neptune's tricks for keeping the metal cool when grinding: an air nozzle fed off the compressor onto the grinding station. 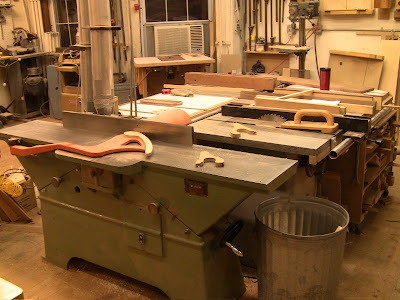 An aircraft-carrier-sized jointer in front of the three table saws. Heavy duty dust collection like some alien life form connecting all the machines. 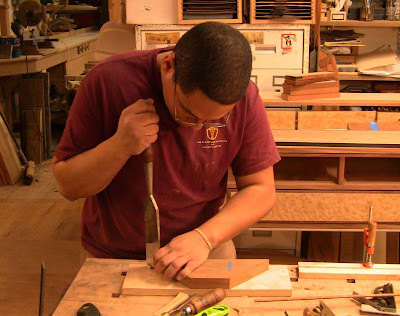 If you're interested in commissioning a piece, have some antique furniture that you'd like restored, or need some bandings for one of your own projects, give Freddy a call at 860-670-2584 or take a look at his website. He has proven skills and experience. Steve -- thanks for the photos and writeup. I especially enjoyed the list of client interactions, very informative. I agree. Excellent profile. What great training he's had! He has positioned himself well for a long and fruitful career. If only I was 18 again and thinking of potential careers.